E.B. 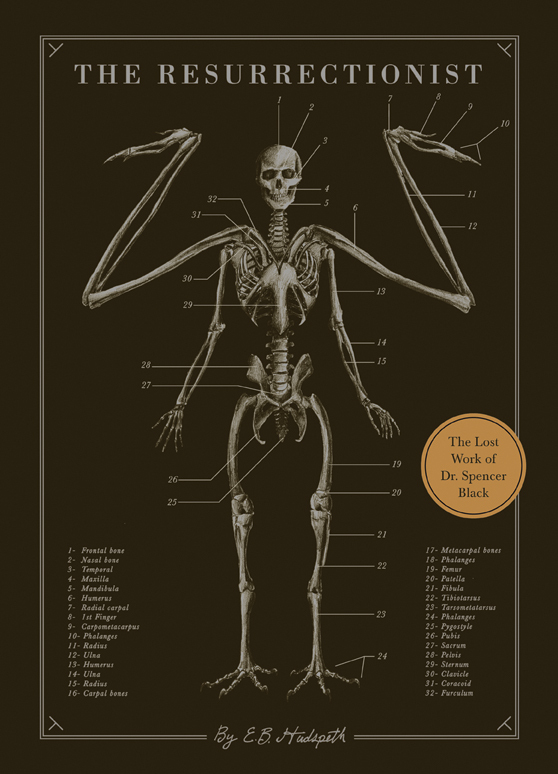 Hudspeth has added something new to the world of mid-Atlantic & New England horror/dark fantasy with The Resurrectionist: The Lost Work of Dr. Spencer Black. He does this by taking the world of art, the world of Edgar Allen Poe and creates an amalgamation with some of the darkest stuff from H.P. Lovecraft. This is not to say The Resurrectionist is derivative of either Poe or Lovecraft. But where some advertising for the book talks about Poe, the book actually exhibits a more subtle reference to ole’ Edgar combined with a heavier reliance upon Lovecraft. The Resurrectionist is, in part, a biography of Dr. Spencer Black, born in Boston, Mass in 1851 as well as a “lost” work containing detailed genus/species style drawings in which are exhibited deconstructed views of vanished beings no longer commonly seen in the world. This collision of art and storytelling is not new to dark fantasy. I think about Lovecraft’s innovative story, “Pickman’s Model,” a yarn of some darkness about a man who found in the bowels of an old city unseen mysterious inspiration for macabre paintings. There are no images in Lovecraft’s story. But one yearns to see them. In this work, Hudspeth (himself an artist) includes lots of drawings of creatures such as Minotaurus Asterion, Satyrus Hircinus, Siren Oceanus and afore mentioned Harpy Erinyes. The allusion here is not to inspiration. Inspiration comes through in other creative ways in the novel. Rather, the drawings allude to another even older form of scientific art – Dr. Henry Gray’s drawings in his famous anatomy book from 1918 – and also coincidentally published in Pennsylvania. The images are integral to the work. Each one will be present in the final edition. On the subject of scientific art, it is here where Lovecraft’s influence is most felt through the work. Not art as in images, but the art of dedicating oneself to finding out the “truth.” A large current running through Lovecraft’s work is the type of story in which a main character becomes intrigued to find out something seen or heard and then follows each possible clue until that thing is found. The problem with this choice for nearly every character whose narrative conforms to this story structure is the characters end up locked away or doing their very best to dissuade anyone else from following in their footsteps. They become traumatized. Nearly 100 years earlier (1818), Mary Shelley structured Frankenstein similarly. Dr. Spencer Black is a young doctor with tons of adoration and respect when he begins his tenure at the Academy of Medicine. He performs surgeries and wrote well-received papers on the medical questions of his day – 1870s Philadelphia. Dr. Black is well respected and well paid. All this changes as he turns more of his energy to figuring out the anatomy of all these mythical beings he is sure exist. And of course, as a scientist, empiricism must reign in his methods. The core of the book and the real Lovecraftian influence is felt through as Dr. Spencer Black’s “methods” are explored by E.B. Hudspeth. The book is dominated by a detached tone. As if he is writing a history. The sections are even segmented by years, e.g., 1869: The Academy of Medicine or 1878: The Fawn-Child. This reserved style adds a lot to the text. Especially in contrast to the fantastical art and the nearly unbelievable way in which Dr. Black swerves his life away from love and peace. The art, as stated above, is stylized after Dr. Henry Gray. But the subject matter…well…therein is the book’s core and play. I have looked through Gray’s Anatomy and have seen none of Dr. Black’s images in those pages. PS: A copy of this review has also been published at LibraryThing. This entry was posted in book promotion, collecting, reading.